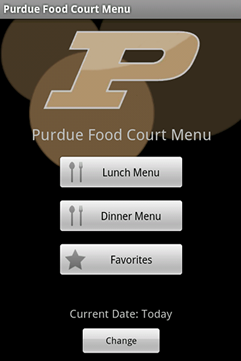 Purdue Food Court Menu is an Android application that gives users direct access to the Purdue food court menus. It provides a quick and clean way to view the food menus, but also includes many other features. The food courts screen give the user the operational times of the food courts, along with location information relative to the user’s location. The app also includes a favorites system where the user can long press on any food item in a menu and that item will be added to their favorites list. The application will then inform the user if any of their favorites have been found on a menu in the future. Feedback is more than welcome! Email me at quinbd@gmail.com.